Each year after the Wimpole Hall afternoon Christmas party a group of enthusiasts go on down to the basement chapel to sing carols, a cappella style. One of the best things is that the event starts out in dusky light and ends up in the pitch black, so no-one can see you sing. Up to a point it means that you can sing your heart out without judgement. I love it. 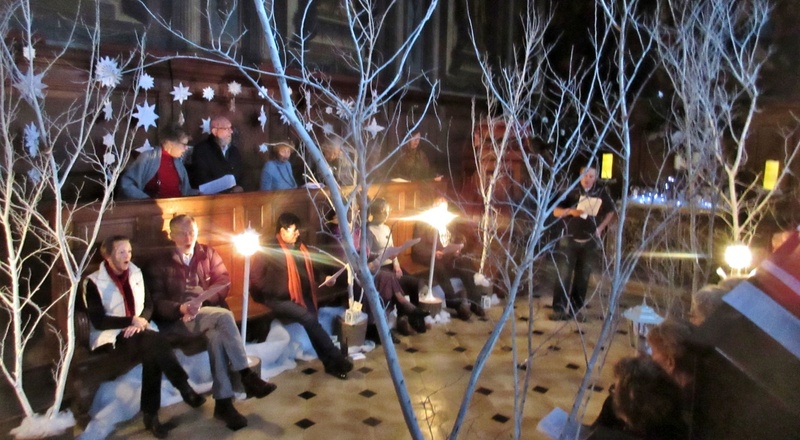 This year it was even more lovely because the chapel has been beautifully decorated with intricate papercut snowflakes and painted white trees. With some newly installed temporary lanterns it was quite fairytale-like. It was all over by 4pm, but it was already dark and raining. I hate short days. It’s such a rush to fit everything that needs doing into the hours of daylight. I should be grateful that I don’t live further north I suppose! Happily, it’s not too long now before we (in the northern hemisphere) reach the shortest day. Then we will have turned a corner and can look forward … to more light, to longer days and to Spring. Winter solstice for the northern hemisphere is on Tuesday 22nd December this year (it’s the summer solstice in the southern hemisphere of course). Winter solstice is associated with the shortest day in terms of hours of sunlight, but in fact the actual winter solstice is an astronomical event that happens at an exact time. It occurs when the sun shines directly overhead at the Tropic of Capricorn. This will be at 04:48 UTC (Universal Time) on 22nd December. For astronomers this event marks the start of winter, but for meteorologists winter begins on 1st December. 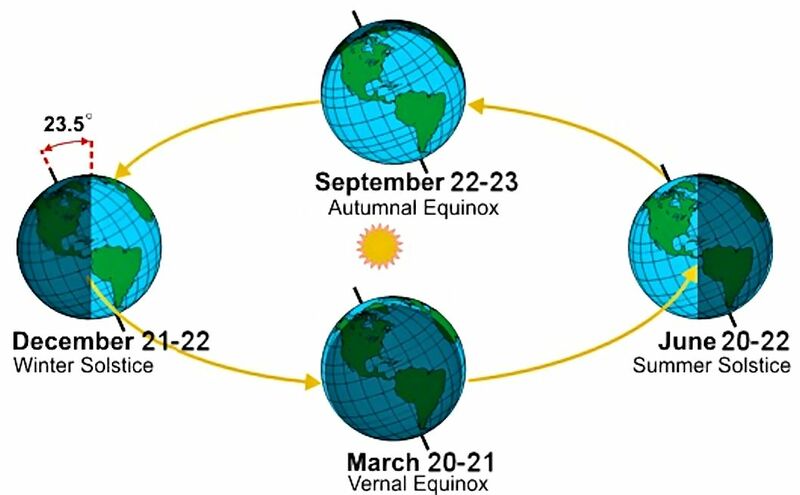 The difference comes about because astronomical seasons begin and end at the solstices and equinoxes. They are events that relate to the position of the earth around the sun and nature. The dates for these alignments change year on year, so to be consistent and to make forecasting easier, meteorologists divide the year into four 3-month seasons beginning on 1st December, 1st March, 1st June and 1st September. It’s all a bit arbitary of course, in fact seasons may begin on completely different dates for cultural reasons. For instance, in the Celtic calendar winter begins on Samhain and the Hindu calendar defines six seasons with dates fixed evenly every two months. One of the most curious things about the shortest day of the year is that most places don’t see their earliest sunset on that day. The earliest sunset usually happens a few days before the winter solstice. It’s a strange consequence of the differences between measuring time using atomic time (watches) and solar time (e.g. 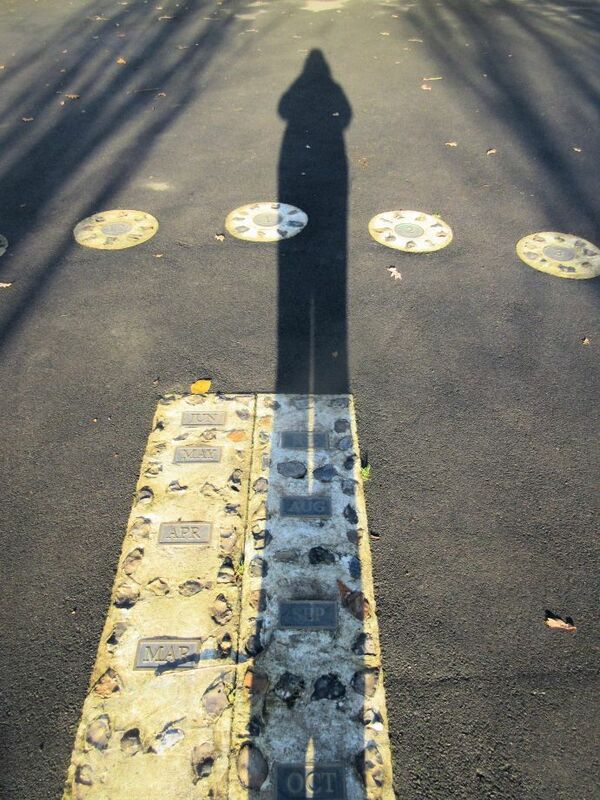 using a sundial). The Time and Date website has fairly good explanation if you want more details. So my cheering news is that for Cambridge, UK the earliest sunset will be on 13th December. Hurray! After that I will have more time to walk the dog in the afternoon. So my earliest sunset is only 2 days away. (The downside to that is that sunrises only start to get earlier by about the same number of day after the winter solstice i.e. ~30th December). Sunsets will start to get later for Cambridge in 2 days time. There have been some pretty gorgeous ones lately. This was on Monday. Like me, some flowering plants respond to daylight hours too or, as was subsequently discovered, to night length. This reaction is called photoperiodism. Plants that respond in this way require a continuous period of darkness longer than a ‘critical night’ length before floral development can begin. One of our classic Christmas flowers, Poinsettia, is triggered into flower by ‘short days’. For poinsettia the nights must be longer than ~13hrs. 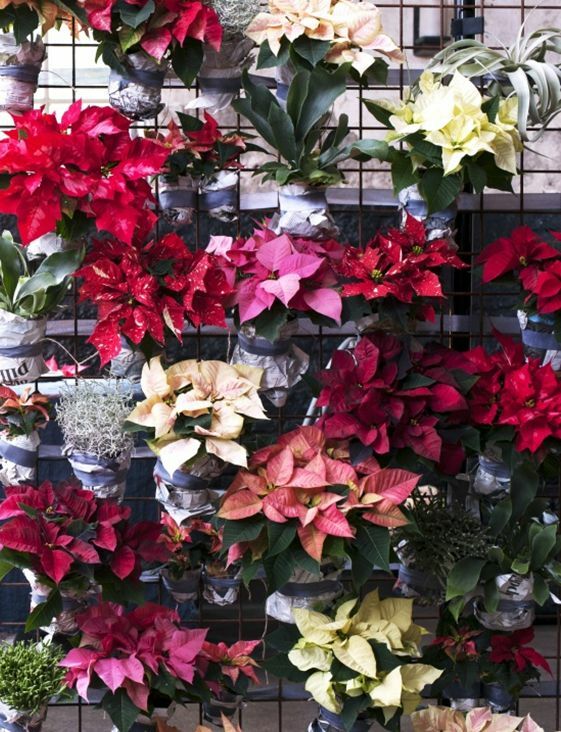 One glance at any supermarket right now and you can see that poinsettias are big business. The science and timing behind the production of Christmas poinsettias has become incredibly controlled, precise and competitive. You can find detailed schedules for the different cultivars online, including their individual critical night lengths, initiation dates, response times etc.. All of which reminds me that I still need to buy one. 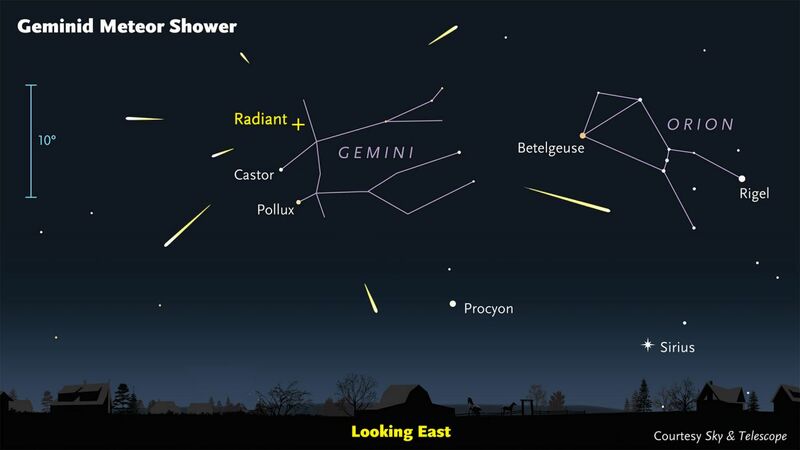 And finally, for the next week or two, if the long winter nights are clear and you can see stars, it is worth looking out for a meteor shower called the Geminids. The Geminid meteor shower will peak on 13th and 14th December and is expected to be spectacular because there will be no moon in the sky, so the meteors will stand out clearly. The meteors will be most numerous around 2 a.m. (expected rate is 1-2 per minute) when the constellation Gemini is highest in the sky (from where they appear to originate). I went out looking two nights ago, but I didn’t see any. The meteors can appear anywhere in the sky, but can be traced back to Gemini. 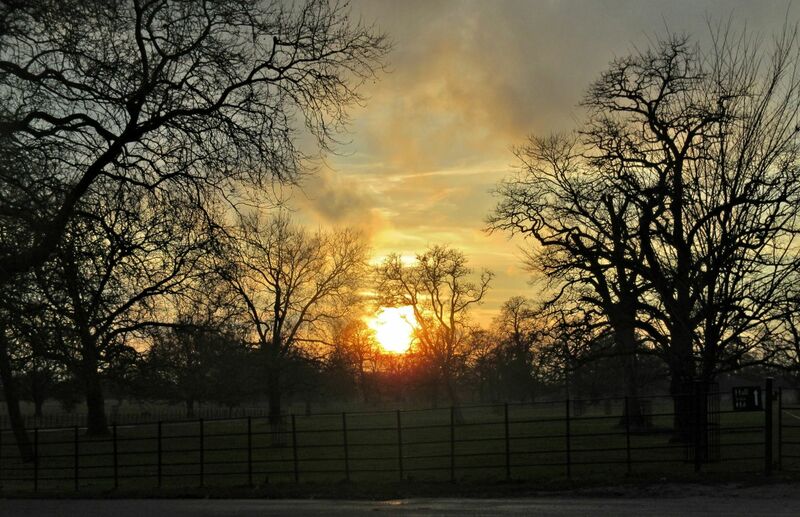 This entry was posted in Nature, Out and about, Science, Wimpole Hall and tagged astronomy, Carol singing, christmas decoration, Geminids, Meteor shower, plants, Poinsettias, seasons, Shortest day, solstice, sundials, sunset, Winter. Bookmark the permalink. I read this on the BBC News feed today and we have already been looking out. Very excited at the prospect we might see one! Happy spotting to you too! Weather over the next few days seems to be against us, but if it clears at all I will be out looking. They are suppose to be relatively slow meteors and leave colourful streaks across the sky, so should be easier to spot. Hail the Solstice! Thanks for the heads-up about the Geminids- I’ll be looking! Carols in the dark sounds magical and, as you note, the decorations make the scene quite festive. I would love to give it a try. I’m typically working at the computer late in the afternoon, so sunset often slips by without notice, but I make a point of having coffee on our new porch to see the sunrise just before 7 a.m. The mornings have been foggy this week and I’ve discovered the early light slices through the tree trunks, creating radiant beams of red haze. Hello. Yes, the carols in the darkening chapel make the xmas tea party worth going to. How wonderful to be able to take coffee on your new porch whilst watching the sunrise. You must be pleased with it. Sunlight streaming through trees is one of my sought after photo opportunities. I hope that you’ve had your camera out?